Anacostia Watershed Society’s annual Anacostia River Earth Day Cleanup & Rally Celebration, 8:00 a.m. - 12:00 p.m. Choose from an array of clean-up sites along several tributaries of the Anacostia River. A full list of sites is available, but nearby options include the Northwest Branch/Hyattsville or Bladensburg Waterfront Park. Household Hazardous Waste Collection and Electronics Recycling Day, 9 a.m. to 3 p.m.
D.C. Department of Public Works is accepting household hazardous waste at Carter Barron Amphitheatre, 16th and Kennedy Streets, NW. The list of acceptable items is long, but a few of the acceptable items include: antifreeze, asbestos tile, batteries, fluorescent bulbs, fertilizer, mercury thermometers, paint, CD rom drives, cell phones, computers, cords/wire, monitors, printers, TV's and VCR's. Chesapeake Green Compost Sale, 9 a.m. to 3 p.m. The Hyattsville Horticulture Society will be holding its annual Chesapeake Green Compost Sale at Community Forklift (4671 Tanglewood Dr., Edmonston, MD 20781) selling Chesapeake Green compost for $3.00 per 40 lb bag *(normally retailing at local garden centers for $5 to $6 per bag). Chesapeake Green is an environmentally friendly soil amendment blended from composted poultry litter, clam shells and wood chips. To preorder or for further information call or email Joe Buriel, 301-864-4882. Ward 5 Homeowner Tree Giveaway, 10 a.m. to 12 p.m.
Casey Trees is sponsoring a tree giveaway for Ward 5 residents at St. Anthony School, 12th and Monroe St, NE. Homeowners can request up to 2 shade trees for their property. Homeowners must pre-register by emailing dcshadetree@earthlink.net with your name, addy, number and types of tree(s): Princeton American Elm, River Birch, or Black gum/Tupelo. For more info, visit Casey Trees. 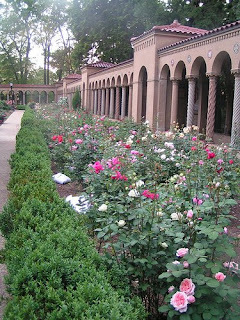 Franciscan Monastery Plant Sale, Sat. 10 a.m. to 6 p.m. and Sun. 8 a.m. to 3p.m. (1400 Quincy St NE, DC). 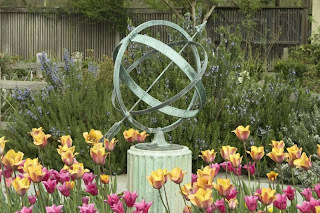 Find your favorite organically grown vegetable and herbs, an inventory of perennials and annuals, spectacular Camellias & Azaleas, expansive addition of woody plants and small trees. For more information, visit the Monastery website. 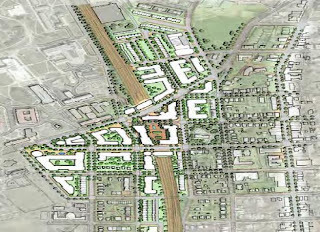 Since 2006, the D.C. Office of Planning has been working on a Brookland Small Area Plan. For those that haven't been following the conversations, a Decking Feasibility Plan was just released April 8th, 2008. The feasibility plan explores possible ideas for decking over the tracks at the metro station. When reading the decking study, you will see visions of open plazas, farmers markets, connectivity from Michigan Ave to 10th Street, new residential development and deck parking. It's a grand vision of what the metro area of Brookland could become, but there is a lot of work (and a few reality checks) between us and anything close to the neighborhood portrayed in colorful sketches in the document. If you want to know more or get involved, there is a meeting coming up. The DC Office of Planning invites you to attend a public meeting about the Brookland/CUA Metro Station Area Plan. All are invited to share comments and questions. Where: Noyes Elementary School, 2725 10th St NE The meeting will be in the school auditorium; enter from Franklin Street. Or visit the DC Office of Planning online. It's short notice but you have two wonderful dinner invites for TONIGHT. 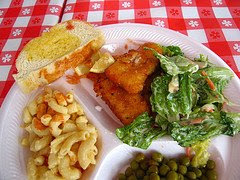 You can choose between fundraising for John Burroughs Family Day while enjoying New Orleans cuisine or join Our Saviour Church for a friendly fish fry. Where: Saint's Bourbon Street which is donating a percentage of the profits. When: Friday, April 4, 3:00 p.m. to 7:00 p.m. When: Friday, April 4, 3 p.m. and 8 p.m.
$7 per dinner (whiting or trout), with potato salad and greens. We predict rain, but don't let that stop you. You'd just get wet and dirty anyhow. While on the them of the great outdoors, find some worn out clothes, you know, the ones you can't even try to get rid of at the yard sale, and join the Alice Ferguson Foundation 20th Annual Potomac River Watershed Clean-up. There are a number of sites but if you want to stick close to home, try the L Street NE clean up (contact Merrit Drucker, NoMa Business Improvement District, 202-722-6716) or Anacostia Park (contact Allison Moller, Email, Southeast White House). Directions are included on the main site. Moonlit Hike on the Mall, April 18, 7 p.m.: It's not in Ward 5, but it's an opportunity worth mentioning. Sierra Club's MWROP is hosting this hike as part of their "Get to Know DC" series. The family is invited, so long as they can walk 7+ mi. (or a shorter 3 mi.) on relatively level terrain. Bring water. Meet on the Mall side of Constitution Ave., halfway between 15th and 17th Sts. Nearest Metro station is Federal Triangle. For more information, contact the leader, Jim Finucane, at 301/365-3485 (before 9 pm). Franciscan Monastery Plant Sale, April 26-27: Unless you drive by the Monastery, you might not hear word of this sale. Their annual sale is a spectacular way to get small plant, especially herbs and veggies, for your garden. They also sell annuals, perennials, roses, and trees. I found the prices last year to be very reasonable, often quite lower than Home Depot, with the added bonus of supporting one of the finest (and most hidden) gems of DC. Great Brookland Yard Sale, April 19: With more than 30 families now participating and several refreshment stations hosted by Menkiti Group, this has grown into an all-neighborhood yard party. Trees for Ward 5 Homeowners, April 29, 10 a.m - 2 p.m., St. Anthony's School at 12th and Monroe: Our soon-to-be neighbors and all around generous folks at Casey Trees have partnered with DDOE to sponsor a tree giveaway for Ward 5 residents. Homeowners can request up to 2 shade trees for their property. Pre-register by emailing dcshadetree@earthlink.net or calling 202.349.1909 with your name, addy, number and types of tree(s): Princeton American Elm (Ulmus americana ‘Princeton’), River Birch (Betula nigra), or Black gum or Tupelo (Nyssa sylvatica). The trees will be in 10 gallon buckets, so these are small enough for the average homeowner to transport home in a car or even a wheel-barrow if you live close enough. Photo by sophiagrrl of the Monastery in full bloom.